Children for the best world! • aesthetic and humanitarian education of children and youth. Additional charges for air ticket Moscow-Split-Moscow and visa. • Closing ceremony of the contest-festival. Award ceremony. Gala concert. • In the application, indicate whether the breakdown of rooms or work will be carried out in one unit. • Fashion theater, fashion collections, fashion shows. • Stage art-1 or 2 rooms of no more than 3 minutes. • Chorus-arbitrary program, timing no more than 10 minutes. • In the application, indicate whether or not the breakdown of the rooms or the work will be done in a single block. • Each performer must provide 2 contest compositions of no more than 10 minutes. No more than three works performed in one technique. Composer, Honored artist of the Russian Federation, member of the Union of composers and the Union of cinematographers of Russia. Academician of the children's television national Academy of Russia, laureate of the Roland Bykov children's film and television development Fund. Author of a large number of albums with songs for children (Russia). Soviet actress, writer and poet, member of the Union of writers of Russia and Croatia (Croatia). Theater and film actress. Winner of awards in the field of dramatic art (Croatia). Honored artist of Russia and Ukraine, artistic Director of the international charity Fund Vladimir Spivakov, winner of the UNESCO prize (Russia). Associate Professor of the piano Department of the Moscow Conservatory, soloist of the Moscow concert Philharmonic Department. Laureate of International competitions (Russia). Musical Director and soloist of the Pokrovsky Ensemble. Teacher of vocal-plastic and speech techniques in Russia, USA and Germany. Winner of international competitions. Member of the Union of theatre workers of the Russian Federation (Russia). Executive Director of the Vladimir Spivakov International Charity Fund and Vladimir Krainev International Charity Fund for young pianists (Russia). Participants of the contest-festival are awarded with special prizes and diplomas. Each category and age category are awarded the title of Laureate of I, II, III degrees, as well as the title of Diploma I, II, III degrees. The absolute winner of the festival is awarded the title of Grand Prix winner. The deadline for applications is April 10. 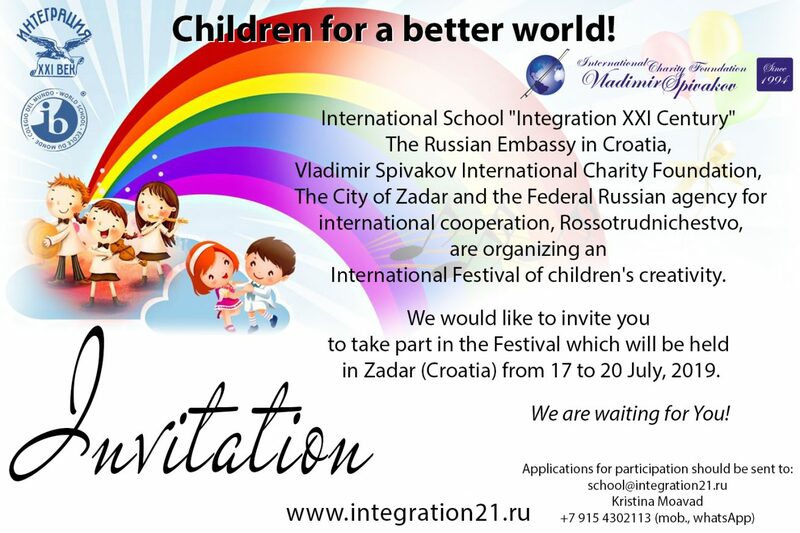 The deadline for payment of participation in the festival is April 25.